There are so many good classic board games that it’s sometimes difficult to pick just one to reminisce about, but a few shine out a little brighter than the rest. 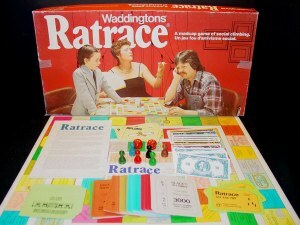 One of my all-time favorite board games is Ratrace, by Waddingtons House of Games. The goal is simple: start from the bottom rung of the social ladder and claw your way up to the upper crust of society and be the first player to retire with $100,000 cash. How you accomplish that goal is where the fun begins! Players start the game with a business and $200 cash. The businesses are color-coded: Rose’s Clothes & Furs; Olive’s Jewelry; Black’s Art Gallery; Brown’s Sporting Goods; Green’s Furniture; and Royal’s Car Sales (blue). Each business gets nine Status Symbol cards to sell to the other players, three each of $100 cards for Working Class, $500 for Middle Class, and $3000 for High Society. 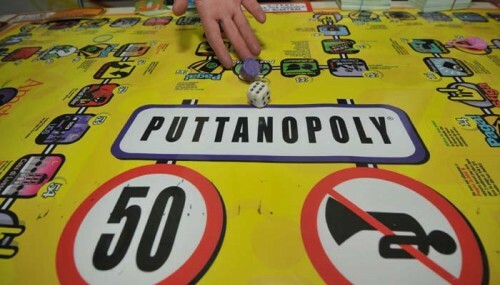 Players need money to make their own purchases, so everyone hopes to see their competing players land on their colored squares. The game board has three tracks, one each for Working Class, Middle Class, and High Society. Everyone starts on the Graduation Day square on the Working Class track. From there opportunities present themselves: can you attend Night School and earn your diploma? Can you make it big (at long odds) at the Racetrack? Will you be accepted into the Country Club and gain a Membership Card? Can you earn money at the Stock Exchange? Players move around the track gaining Working Class status symbols, such as a New Car Radio or a 17-Jewel Watch. Gain any three Status Symbol cards and you’re ready to move up to Middle Class – as long as you have a little cash and either your diploma or club membership. Of course, you could get lucky and land on a Society Wedding space and move up without all the qualifications everyone needs. Middle class brings similar challenges and goals as the Working Class rung did, as players still need to buy Status Symbols (but more expensive! 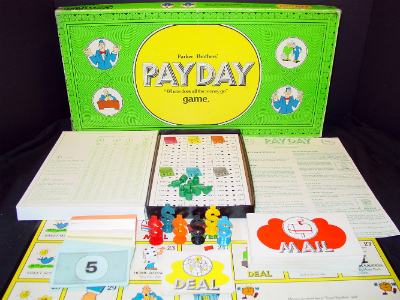 ), get a Yacht Club membership or a University degree, and accumulate cash as they move through the game board. But watch out! At this stage of the game the much-feared Divorce square could send you back to your Working Class roots. Gaining entry into High Society is exactly the same as before: three Status Symbol cards, either a degree or club membership, and enough cash to afford the lifestyle. And the pitfalls on this part of the game board or similar to Middle Class, but much more devastating when they happen. 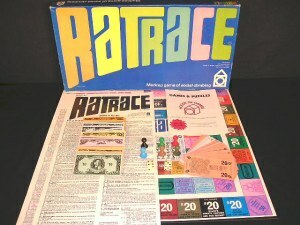 There have been several Ratrace games since it was released in 1967. I know of editions put out in 1970, 1971, 1973, 1974, 1983, and 1994, each of which had some minor modification to the game pieces, but no change in the game mechanics. 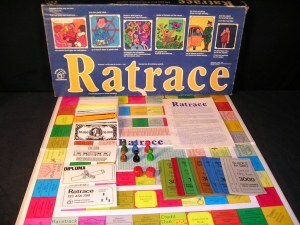 Although the player tokens in the shape of actual rats in the 1983 black boxed version are fun, my favorite Ratrace game is the 1973 release in which the Status Symbol, Membership, Diploma, and Credit cards are on heavy card stock, and the game tokens are made of wood. I enjoy playing a game that feels like its meant to last, and can handle a little family playing time, but I also like the natural material feel of the game pieces. Other versions use laminated cards and plastic tokens, which, although they will last, just don’t have that same retro feel. But, it’s a minor quibble, as any of the games still play the same. 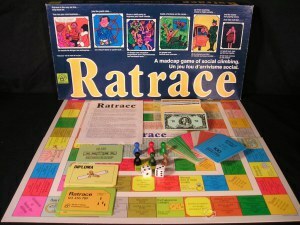 Ratrace is best played with at least three people, but it can be played with as little as two and as many as six. 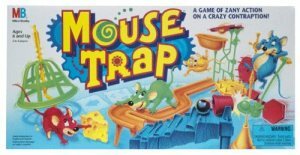 The game suggests a starting age of 9, but anyone who understands the reasons why people want to “move up” in life will enjoy this game, regardless of age. Another highly recommended classic board game!